Garden writer, broadcaster, designer and former Hillier Director, Andrew McIndoe, has been awarded the prestigious Veitch Memorial Medal, one of the highest accolades in the world of horticulture. 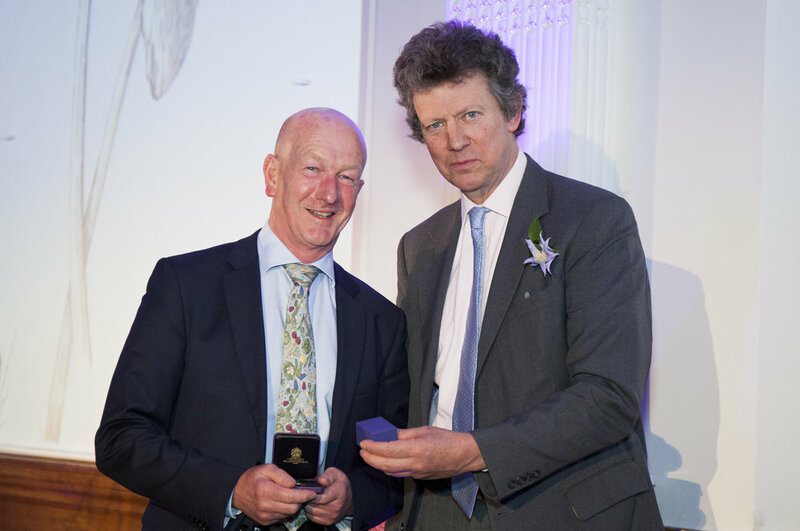 Sir Nicholas Bacon, President of the Royal Horticultural Society, presented Andy with the Veitch Memorial Medal at the prestigious RHS Awards ceremony in London, on Wednesday 22 February in recognition of his outstanding contribution to the advancement of the practice of horticulture. Andy has had a lifelong fascination with plants. He studied horticulture at Bath University before joining the world-famous Hillier Nurseries & Garden Centres in 1978, working his way up from garden centre manager to be the first Managing Director from outside the Hillier family. Andy designed a staggering 25 Gold medal-winning gardens for Hillier at the RHS Chelsea Flower Show in as many years, and has lectured worldwide, written nine gardening books and contributed to countless gardening broadcasts and publications. Since stepping down from Hillier in 2015, and now aged 60, life for Andy is busier than ever. He runs a thriving and varied business as a garden designer, book author, radio presenter, garden writer and horticultural consultant, and gives gardening courses, lectures and tours Europe-wide. Andy is a trustee of Greenfingers, the charity that creates gardens for children’s hospices. In the summer months, Andy and his wife, Ros, also welcome groups to their stunning two-acre naturalistic garden at Sandhill Farm at Sherfield English in Hampshire.